The weather is getting little chilly here; it's perfect for cultivating that coat sew-along mood! So I decided to put together a series of resource posts to get you primed and prepped. The pattern, Butterick 5824, can be obtained in a few ways. This week is a great time to buy--check out the sales! 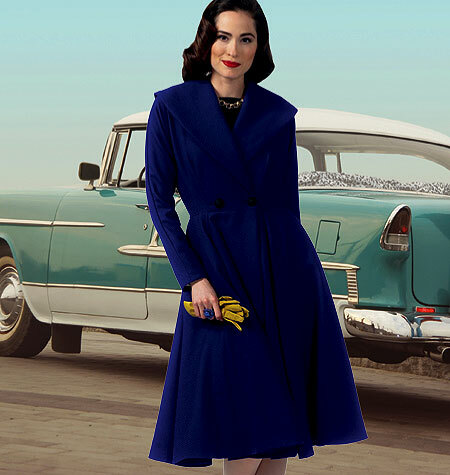 The Butterick website is having a sale this week! The pattern is $1.44. And only $1.22 if you're a Club BMV member. The sale ends on Thursday the 20th. You can shop at your local Joann Fabrics. Buttericks are 99 cents through Thursday! Definitely call ahead of time to see if your store has it. Some readers are reporting that their Joann has not stocked the new patterns yet, though I found it last weekend at the Poughkeepsie location. UK readers! You can order from Sew Direct to get good shipping rates. Australia readers! Check out Sew Squirrel, who has a selection of my patterns. Check back tomorrow for a whole post on interfacing! ARGH! I, too, was unable to find it at my JoAnn - none of the new Buttericks were stocked yet - but Fabric Depot had it. I knew it would be expensive there (only 50% off list) but didn't want to miss getting one, so I cringed and spent almost $10. At least I could support a local business, avoid paying shipping, and eliminate another 45 min. in the car (which is a big deal as I am a bike commuter during the week). Very glad to have pattern in hand. Soon it will be muslin time! I was at my local Joann's yesterday morning when they opened to make sure I got one, and I did! I'm not sure I'll be able to keep up with the sew-along in real time, but I'll certainly make this coat in the future. Will this sew-along be available when it´s done? I can´t afford the pattern at the moment and shipping is expensive to Sweden. I ordered mine from Butterick directly (with the dress pattern you designed Gertie) and I'm hoping I get it before Oct 1st....I live in Canada and sometimes packages can take forever! Woo hoo! I ordered my pattern from Butterick (Also ordered the B5814 dress - WOOT!) and it came today!! SO SO excited!! Ordered a copy each of the coat and the dress patterns directly from the Butterick site. Can't wait to see them. Not sure when I'll have time to make either one up as I have another coat pattern on my sewing table at the moment. but we shall see. And I figure your sew-along will help with tips even on a different pattern. I ordered my pattern, but I doubt I will be able go join the sew along *tears*. I just cannot find a fabric I love and it would have to be love because I don't see making this coat more than once maybe twice as it is such a statement piece. It is going to take at least a year before I find THE fabric and the estimated $200. But I will be printing out all of the blog entries and sticking them and the pattern in a plastic bag for future reference. And heck I already have a queue of 4 items from the book I want to do! I got mine! (And the dress as well. I can't resist a pattern sale.) Very excited for this! I purchased my pattern today at JoAnn for 99 cents. I don't know that I'll have time to do the sew along though =( due to other busy-ness craziness. I desparately need some coats though, winter and spring/autumn and perhaps even ocassional. I found a lovely fabric today that I hope would work. I forget the fabric blend, but I think it's about 75% cotton, 20% rayon and 5% spandex. Is that a poor choice? It has a gorgeous drape. FYI - "sewing patterns dot com" is also having a 99 cent sale on Butterick through Sunday 9/23 if you still need the pattern! I was able to order my coat pattern today from sewingpatterns.com they have the 99 cent sale. I was not finding in the local Joann's in Las Vegas.